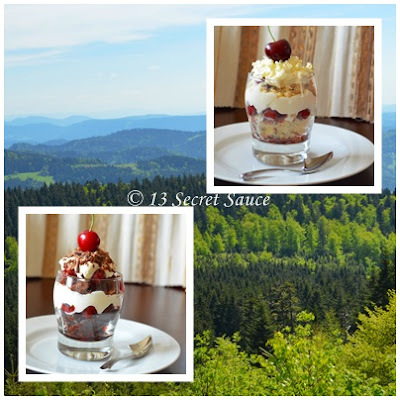 "Black Forest Trifle" & "White Forest Trifle"
I am falling in love with these small dessert served in glasses or small bowls, absolutely. They call it "Trifle". Multiple layers of fruit, cream, cakes, jellies soaked in juices that delights your senses with so many colors and texture. Full of flavor in each and every layer make it a stunning dessert for any occasion. Trifle ('trifle') is a dessert from the English kitchen. It consists of several layers served in a glass bowl. The classic trifle is lower layer cake pieces then sprinkled with sherry; across them some fresh fruit, such as strawberries or peaches and finally a layer of custard or custard. However, there are many variations are possible: the cake can be replaced by the cookies or brownies, and instead of the custard pudding may also be covered with ice. Today I am making a black forest and white forest trifle , definitely inspired by my last week's trip to "The Black Forest" (German: Schwarzwald). 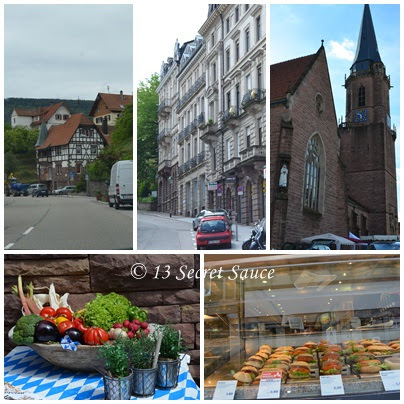 It is a wooded mountain range located in the southwest corner of Germany in the German federal state of Baden-Württemberg. And of course the market is flooded with the season's fresh cherries. All this was enough of a temptation to make this yummy trifle. I am going to share some amazing pictures from our trip which will justify the reason making this lovely dessert. 1) Cook the pitted cherry, sugar and balsamic vinegar in a saucepan for 5-7 minutes until soft and dark. Set aside to cool. 2) Whisk heavy cream to get a soft peak. Add vanilla sugar and vanilla essence and whisk again to mix. 3) Break both chocolate and vanilla sponge cake roughly using hands. 4) To set the trifle, take your favourite glass or bowl. Layer the chocolate and vanilla sponge cake separately in 2 glasses at bottom, top it up with the cherry and juices, put a layer of vanilla cream on the top. Repeat the layers. 5) Put some shredded chocolate on the top, white chocolate for white forest trifle and brown chocolate for a black forest trifle. 6) Top it up with a fresh cherry and refrigerate it until served.